One of the biggest benefits of having Windows 10 is using the Windows Store. This important feature has essentially become a one-stop shop for all kinds of content, including apps, games, movies, music and TV shows. Not only can you purchase a wide selection of content right from the Windows Store, but your purchases will automatically be synced across all of your Windows 10 devices, including your smartphone, PC, tablet, and even your Xbox One console (if you have one). This may seem obvious, but lots of people forget to use the search function and spend their time flipping through suggested choices from the Windows Store content library. In order to find something, click or tap on the Store tile in the Start Menu, then type into the Search box in the top right corner. From here you can search all of the content in the Windows Store, including games, apps, movies, and music sorted by artist, track, or album (whichever you prefer). 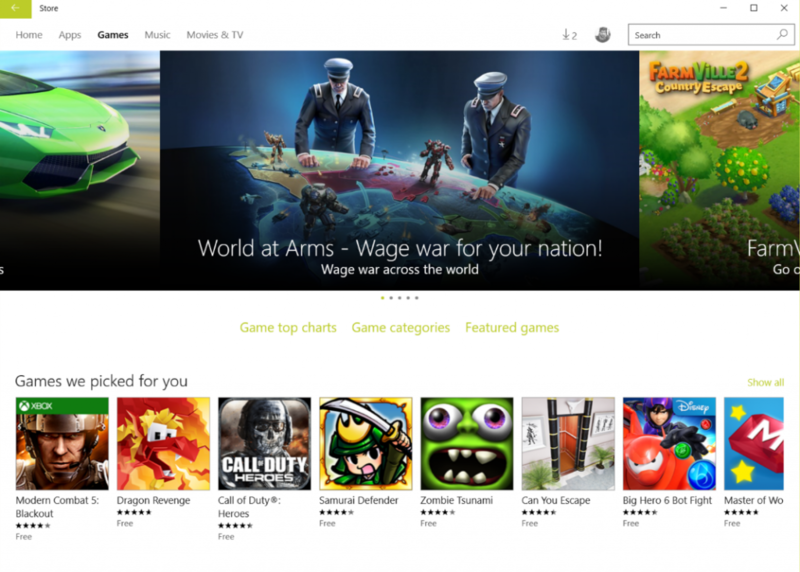 One of the best features about the Windows Store is that in addition to heaps of content that you can buy, there’s also a wide selection of free content like apps and games to try out and enjoy. To peruse the selection of free content, just check the Top free sections of both the Games and Apps pages and try something new! Not only can you spend your time trying out new games, but the Microsoft Store is loaded with lots of apps which are actually pretty useful, and which will be recommended to you based on your browsing, app, and search history. There’s also a variety of offers for free music and movie downloads as well, so make sure not to miss out! The next time you come across your favourite album, or a game that you just have to try out, you can choose from several payment methods, including using your debit card, your credit card, a PayPal account (if you have one), or Microsoft gift cards. Now, buying new content is easier and less hassle than ever before, which means you can enjoy your purchases faster. Keeping track of what you downloaded, and on which device, can be a giant headache. But when you use the Windows Store you can access you library anywhere by opening up the Store and clicking on the My Library menu. This will open up a list of your most recent downloads and purchases, no matter whether you downloaded them for free or bought them online. It also displays links to the music, TV, and movie apps where all of your multimedia content is located and easy to find. For help configuring your Windows 10 PC and keeping your information safe, contact us at 204-586-7953 and let one of our Support Heroes help!